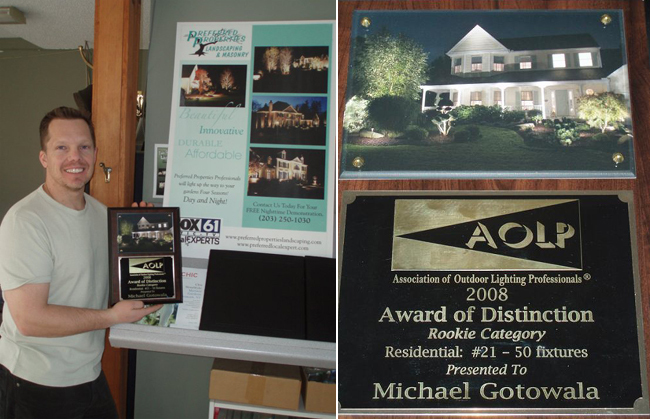 We are honored and proud recipients of two National Outdoor Lighting and Landscape Lighting awards from the AOLP- Association of Outdoor Lighting Professionals. Our Outdoor Lighting installations have been featured and showcased front cover on many popular publications as This Old House, Total Care Landscape, Connecticut Resident and Luxury Pools. 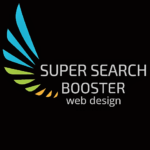 We also have been featured on television on BETTER CT., Channel 3, and on Fox 61 here in Connecticut. Properly licensed in the State of Connecticut and designing landscapes out of our own Nursery for the past thirty years has given us the insight and plant based knowledge to observe plant growth and characteristics in every season of the year. This contributes to our success as award winning Outdoor Lighting specialists inherit in the ability to see the Landscapes, hardscapes and architecture of the home as it should appear lit at night. This is paramount to achieve the best outdoor lighting portrait as we are builders of hardscapes, leaders as plantsmen and award winners of lighting. So When I say “If you want the BEST IN OUTDOOR LIGHTING LET ME SHOW YOU JUST HOW GOOD YOUR HOUSE LOOKS AT NIGHT”. I can truly attest to the professionalism of Outdoor Lighting and Landscape Lighting. A landscape designer who is licensed for low voltage is an ideal candidate to bring out the best of your night lighting scene. Electricians are more technical and at times we need them for the ﬁnal engineering and Line power installation. But electricians don’t really portray the best visions when it comes to understanding the landscape and how it should appear lit at night. Being one of the very ﬁrst horticultural professionals with an electrical L-5 low voltage license in the State of Connecticut has made our designs stand out amongst the rest. We understand the landscape and know how the greenscape and hardscape should interact among one another in the night, Areas you are familiar with during the day disappear into the night. Preferred Properties Landscaping has the experience and vision to show you how these elements should appear lit at night. The ﬁrst step is to contact a lighting specialist–one who understands the plant materials and hardscapes at hand. A landscape designer with award winning Outdoor lighting capability who understands the illuminance composition necessary to bring the space to its fullest beauty. This may mean bringing in plant materials, sculptures or focal pieces to complete the lighted scene. We have a fully specialized masonry staff who can locate the ﬁxtures where most would shy away from. It is this type of attention to detail that makes us an extraordinary ﬁnd for Outdoor Lighting. An electrician offers strengths and technical know-how, but falls short when it comes to producing award winning results for this type of landscape lighting portrait. Landscape lighting does not play a role in the technical aspect. Michael is clearly one of the best landscape lighting designers in the country. In my role as a photographer of outdoor lighting, I’ve visited and photographed many of Michael’s projects – not only were the lighting designs creative and effective, they were also installed perfectly with a great attention to detail. My photos of Michael’s projects have been published in numerous trade journals and design magazines. Editors are thrilled with these outstanding examples of landscape lighting. Michael has embraced both the art and science of lighting design and applies it to create compelling nighttime environments for his very lucky clients. I wholeheartedly recommend Michael for any kind of outdoor lighting product. You will be thrilled with the results.